What are the consequences of staying in or moving out of a socioeconomically disadvantaged neighbourhood? In European urban sociology, research has mostly focused either on lower class ethnic minorities, or on white ethnic majority middle classes. 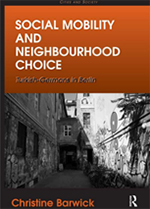 By contrast, studies on upwardly mobile ethnic minorities are scarce, a gap that this book fills by looking at upwardly mobile Turkish-Germans living in Berlin. Those Turkish-Germans in Berlin, who decide to move out of a low status neighbourhood, mostly in order to find a better educational infrastructure for their children, show various strategies to keep ties back to their old neighbourhood. Moreover, the movers now living in neighbourhoods with a high share of native-German residents, where they stand out as the other, keep ties to other people with a Turkish background, not only through socializing with co-ethnics, but also through various forms of voluntary involvement. Hence, a move presents a spatial withdrawal from a socioeconomically weak and ethnically diverse neighbourhood, but it does not imply that this neighbourhood no longer plays a role in Turkish-Germans’ daily practices or as somewhere with which to continuously identify. Barwick’s sophisticated study shows that moving and staying are both active decisions and they both have positive and negative consequences. Thus, movers and stayers alike develop coping strategies for their respective situation, and develop particular daily practices and forms of identification with place.